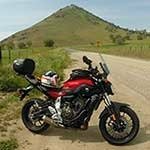 Did any of you use this site before buying your FZ-07 ? Doing all the online research I definitely used this site's information before I made my purchase. Thanks! I joined this site 3 years before I finally got my '18 MT. I had read about it in all the bike mags and everyone kept saying it was the new SV650. I had a 2001 SV and loved it. Kept it for 11 years and always regretted selling it. I'm 230lbs geared up so the only shortcoming was the complaints I kept seeing about the limp suspension. I bought 2 other bikes during those 3 years, an FJ09 and a S10ES. They both had their good traits but I longed for that lightweight "toss it around" aspect that the SV always had. Then I read about the '18's improved suspension and that put it back on my radar again. The kicker was seeing them at my nearest Yamaha dealers with $1300 discounts. Had one in my garage within a week. Sold the S10 the next week and don't regret a thing. This bike is great now that I have the suspension set up for my fat a$$. And this forum is daily reading. P.S. MT is better then the SV. 10 more lb/ft torque from 2500 to 7500 rpm. Whoo-hoo!! This site was definitely part of my deep dive when choosing what would be my first M/C in almost 30 years, after narrowing it down to the FZ-07. I bought the "naked" FZ-07 for pretty much the same reasons I bought my last bike which was a "UJM" (Universal Japanese Motorcycle 80s version of Naked) Yamaha Radian. Both were best bang for the buck midsize configure it to do whatever you want it to do bike. Yep, that's why I picked the screen name maybe07. I still don't have one. I am waiting for the Ice Fluo colour scheme. How do I get in on this back-end wheeling and dealing brought up in this thread a few times? I'd love to get a decent price. The one dealer I've contacted so far quoted me $8800 OTD. There's no way I'm paying that much. I've driven 5-6 hours one way in the past to get the price I want for both my car and my current bike, and really don't want to have to do that again. Send some of those backdoor deals this way, please. @WankyMcTugger I'm not sure where you are located but I was on Cycletrader last nite and saw a new '18 at a dealer up near Cleveland I believe that they had listed for $5999.00. I don't know what there tack on charges are but for that price you could almost buy it over the phone and have it shipped. The dealer is Rick Roush Motorsports in Medina, Ohio. 1-888-412-9070. Hope this helps, best deal I've ever seen on a new 07. I lurked here and some other places, when I was THINKING about buying into the FZ-07 hype. I had not registered or introduced myself at that point. Go to snow country with a truck and walk in on a wd when the sales reps are praying someone walks in. January in Snow country mid week day is best time of any year to save over 1500 on a new bike. This is no shet, the truth. Or call and have it shipped for around $400 total and still come out cheaper than warm areas. I joined this forum the day I got my first FZ-07 on 31 July 2014, now I'm on number two. Amazing bike, amazing people, amazing forum. Can't lose. Came across this site while researching what bike I might buy. Think I signed up for the site a few days before getting the keys to my FZ last spring. I joined the forum on 1/9 (first found it a few days prior to that) and purchased the bike 1/12. Was leaning towards the MT-07 but did some research first, and this site was an integral part of that research. Saving up for the bike right now. Site definitely helped me decide on what parts I want to put on it. (Already got a list of 2k worth of parts already ). Plan on getting a black '18 or '19 depending on the stock at the local BC dealers. Can't wait to get it! I've ridden my buddies FZ09 and looking at what everyone says about the 07 I knew it would be the perfect fit. I ordered mine yesterday! Now they just have to build and ship it. I should have it in late March or early April. I really wanted to hold out for Ice Fluo and am happy I did. I think I'll be much happier with this colour.